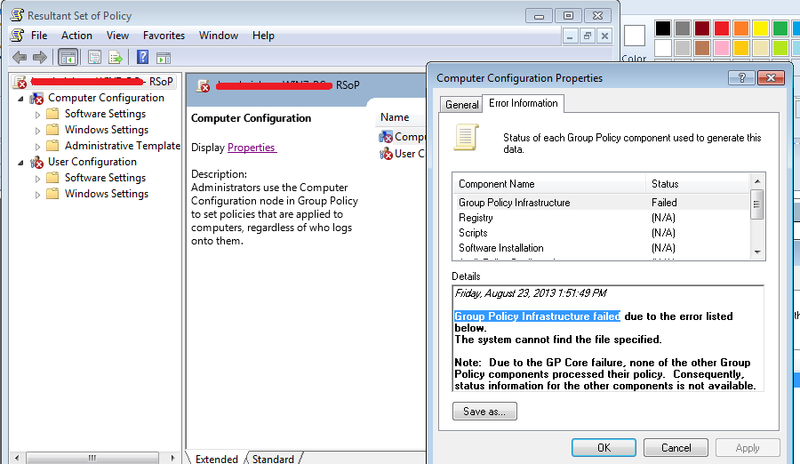 I have got this Group Policy Infrastructure failed error in Windows 7 machine while working with GPO to configure Audit Policy settings. I was in need of configure Audit logon events policy as Success,Failure to audit logon,logoff and logon failure of every users with their workstation by the Event IDs 4624,4634. So that I have decided to apply Audit logon events policy to workstations through Default Domain Policy. After edit the Audit logon events policy in Default Domain Policy as Success,Failure, I run the command GPUpdate /force in domain controller. then I moved to one of the workstation Windows 7 computer which is in the Domain Network, to check whether the Audit logon events policy is applied or not through Default Domain Policy. To check final result I run the command rsop.msc to view Resultant Set of Policy. I see the following output with Group Policy Infrastructure failed error. Group Policy Infrastructure failed due to the error listed below. Note: Due to the GP Core failure, none of the other Group Policy components processed their policy. Consequently, status information for the other components is not available. I got resolved this issues by removing my Windows-7 PC from Domain Group, and changed to Work Group. Then again added the machine to Domain Group. 1. 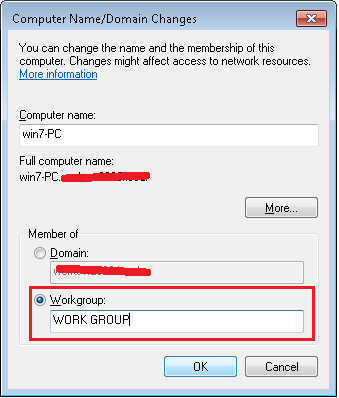 Right-click the My Computer, click Change Settings, click the button Change, then now change the Member of from Domain to Work group. and click OK..
4. Again right-click the My Computer, click Change Settings, click the button Change, then now change the Member of from Work group to Domain . and click OK..
6.Now login with Domain user account and check Resultant Set of Policy by running the command rsop.msc. now you will get resolved from issue. After I haved researched through google, I got many suggestions to edit hosts file. The HOSTS file located in C:\Windows\System32\drivers\etc contained entries for my domain controllers. I simply removed entries which relevant to domain controller from the HOSTS file and now my Windows 7 pc get rid off Resultant Set of Policy issue. Hope this will help some of you. and also I simply request you to comment if you got any other solution as it will help others. Note: Please be cautious while you edit HOSTS file since it will make unwanted network issue if you edited with fault settings.